How do electrical currents work? Can you teach the difference between alienating and direct current? Educators with a love for physics take the Praxis II Physics: Content Knowledge (5265) Exam. By taking and passing this test, these educators show they have the skills to teach physics in secondary schools. Several states use the Praxis tests as part of their licensure requirements. It’s a hard exam that requires preparation and study. 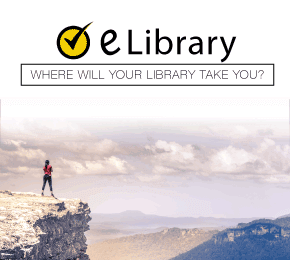 This guide explains the test and provides a study guide recommendation that can help you best prepare for the exam. 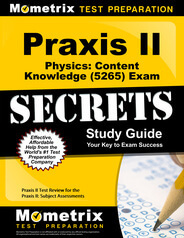 How many questions are on the Praxis II Physics: Content Knowledge (5265) Exam? There are 125 selected-response questions on the test. Some of them may be unscored. Candidates have 2.5 hours to finish the test. Since this is a physics exam, can I use a calculator? No. Calculator use is prohibited. At what locations can I take the exam? The Praxis tests are available at hundreds of testing centers across the country. You can search for a test location on the Praxis website. How many categories are on the Praxis II Physics: Content Knowledge (5265) Exam? Mechanics. The largest test section with 40 questions makes up almost one-third of the exam. It covers vectors and scalers, kinematics and dynamics, and fluid mechanics. Candidates must prove their knowledge of motion (linear, simple harmonic, circular, projectile); Newton’s three laws of motion; rotational motion (torque, center of mass, etc); elastic and inelastic collisions and the differences between the two; and Kepler’s three laws of orbital motion. Electricity and magnetism cover, in its 24 questions, electric and induced charge; electric field and flux; conductors, insulators and semiconductors and their electrical properties; alternating and direct current and the differences between the two; and simple series and, parallel and combination circuits analysis. Optics and waves have 16 questions. It includes waves type and characteristics; Doppler effect fundamentals; and sound characteristics such as pitch and frequency. Heat, energy and thermodynamics have 15 questions, looking at areas that include temperature, temperature scales and thermal expansion; heat transfer mechanisms; kinetic molecular theory; and thermodynamic laws including Zeroth law and PV diagrams. Modern physics and atomic and nuclear structure also has 15 questions with topic areas that include matter and its organization, structure and states; atomic and subatomic structure; radioactivity characteristics, processes and effects; and modern physics topics such as special relativity and photoelectric effect. Scientific inquiry, processes and social perspective, with 15 questions, examines scientific inquiry and its history and nature; scientific procedures and techniques; data and how to collect, process, analyze and report; and how physics and technology have impacted society and the environment. How is the test passing grade determined? Passing scores are set by each state, so you’ll need to check with your licensing body. Will I receive my test results as soon as the exam is over? Maybe. Some test results will be available at the end of the test. In other cases, test results won’t be available until 10 to 16 days after the exam or test window close. Do I need identification on exam day? Yes. Please make sure to bring a driver’s license or other acceptable government-issued ID. Also, make sure to bring your test admission ticket. Please arrive at least 30 minutes early. Late arrivers might not be allowed to take the test. What personal items can I bring into the test room? None. Test rules prohibit personal items from being brought into the test room. That means no electronic devices, like mobile phones, and many items of clothing, like coats. I want to be a physics teacher but need help preparing. What materials should I get? 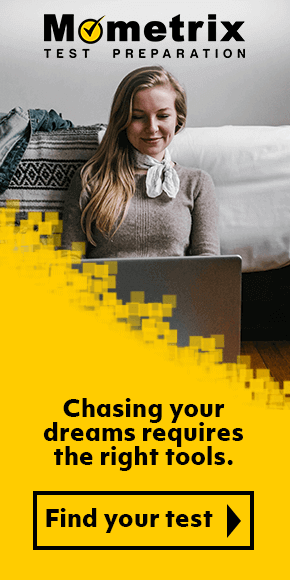 You’re in luck because Mometrix has what you need. Our company uses test preparation experts to create the best study tools on the market. Our study guide shows candidates how to break down the subjects they’ll see during this tough test and does so in easy-to-understand language. Our large and convenient flashcards mean who can take studying anywhere you go. Take a minute or two to review material while learning via the effective tool of repetition. 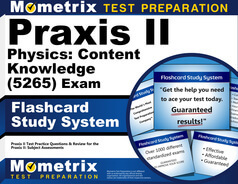 These tool as what you need to prepare for the Praxis II Physics: Content Knowledge (5265) Exam. Mometrix Academy is a completely free resource provided by Mometrix Test Preparation. If you find benefit from our efforts here, check out our premium quality Praxis II Physics: Content Knowledge (5265) study guide to take your studying to the next level. Just click the Praxis II Physics: Content Knowledge (5265) study guide link below. Your purchase also helps us make even more great, free content for test-takers.